After a rather weak sales caused by the economic crisis, the Audi Q7 car is ready to return, he reveals himself a new generation. Until then, some of the information attributed to a kind of rumors, but now the network there were first spy shots of the car. Looking at these pictures, we can note that car front wings are wider than its predecessor. It also became shorter and the front overhang. 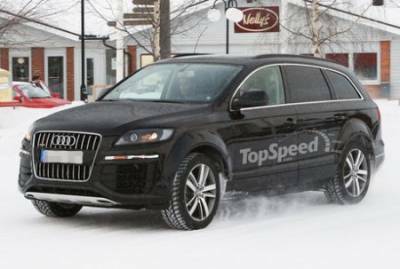 According to rumors, the new Q7 model to lose weight about 400 pounds. To achieve this, Audi engineers to create cars will use lightweight materials. Such as aluminum or carbon fiber filament. As for the engine, then there is still more interesting: it seems that Audi's plan to eliminate the use of the current large engines in favor of some size. The hybrid motor also not be discounted.